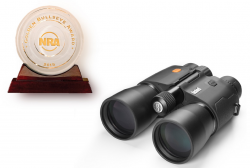 OVERLAND PARK, Kansas - April 10, 2015 - The National Rifle Association’s (NRA) American Hunter magazine has awarded the Bushnell® Fusion 1-Mile ARC rangefinding binocular with the Golden Bullseye Award for 2015 American Hunter Optic of the Year. For the past 13 years, the Golden Bullseye Awards have recognized the finest products in the shooting sports. Representatives from Bushnell accepted the award during a special breakfast at the 2015 NRA Annual Meetings & Exhibits on Friday, April 10 in Nashville, Tennessee. The honor underscores the ability of the Fusion 1-Mile line to meld the best of Bushnell binoculars with world-leading laser rangefinding capabilities, providing hunters the best of both worlds. Fusion 1-Mile rangefinding binoculars provide rich contrast and stunning clarity from edge to edge with premium fully multi-coated optics and BaK-4 prisms. At the push of a button, they display exact distance to a target from 10 to 1,760 yards. The built-in ARC Bow Mode delivers “shoots-like” horizontal distance, while an ARC Rifle Mode provides precise bullet-drop and holdover information. Matrix Display Technology, RainGuard® HD anti-fog coating and a fully waterproof design ensure reliability and clarity in all conditions.